SCVHistory.com | Newhall County Water District Story. Newhall County Water District | 1999. The Santa Clarita Valley, located in the northwest region of Los Angeles County, is blessed with an incredibly rich history. Indians, Mexican Dons, gunfighters, California's first gold rush, oil strikes, dromedaries, a famous train robbery, a serious presidential candidate, a genuine First Lady, a horrific dam disaster, and cowboy movie stars are just a few of the components that form the essence of the valley's heritage. It is interesting to note that the valley's first historian was Arthur B. "Perk" Perkins who moved to Newhall upon acceptance of the general manager position for the rookie Newhall Water Company, predecessor of the present-day Newhall County Water District. When Perkins arrived in 1919, there were only 600 people in the valley. Water is an underlying factor to the history, growth and stability of the ever-changing and ever-growing population of the area. The Santa Clarita Valley hosts a world-renowned water delivery system in the mighty California Aqueduct approved by voters in 1960. It is still the world's largest water delivery system. Supplemental State Project water flowing through the monumental aqueduct a total of 300 miles from the Sacramento Delta in the north to nearby Castaic Lake is sold wholesale to Newhall County Water District by Castaic Lake Water Agency. It may be hard to believe, but the Santa Clara River used to flow bank to bank up until the 1800's. Newhall County Water District continues to pump ground water from the Alluvial Aquifer beneath the Santa Clara River to supply residents in the Pinetree water service area. In 1878, the town of Newhall relocated from its location near Soledad Canyon and Bouquet Canyon Roads to 8th and Spruce. What was the reason? Water! A drought forced city officials to move closer to the deeper wells in the Newhall area. Today, five District wells situated along San Fernando Road (formerly known as Spruce Street) draw ground water from the Saugus Aquifer. The Castaic Creek Alluvial presently supplies four District wells. William W. Jenkins, former California Rangers captain, lived with his family on the Lazy Z horse ranch along Castaic Creek at the turn-of-the century. A feud began there when Jenkins contrived a boat with wheels to navigate government surveyors over "swampland" acreage he claimed as his own. The land legally belonged to the Carmichael and Rose families who turned the feud into an all-out range war eventually leaving 21 people dead. Up until the 1930's most residents did not have indoor running water. Until Southern California Edison and Southern California Gas started marketing the indoor water heater. The privately owned Newhall Water Company was supplied from six wells. Well Station No. 1 was the oldest having been drilled in Railroad Canyon in 1909 and capable of delivering 45 gallons per minute. A 360,000-gallon redwood tank situated 250 feet above Newhall's mercantile district served as the only means for water storage. A local historian recounts a story about A.B. Perkins who, because he was the Water Company's general manager, was constantly being teased about the quality of the water. One day in November 1948, at the local post office, a resident stopped Perkins and asked if he could start putting the mud back in the water again. She said the November winds were blowing away all of her topsoil! In the early 1950s, local business and civic leaders agreed that it was in the public's best interest to form a community water district. After considerable scrutiny, the issue was put in the hands of the voters. 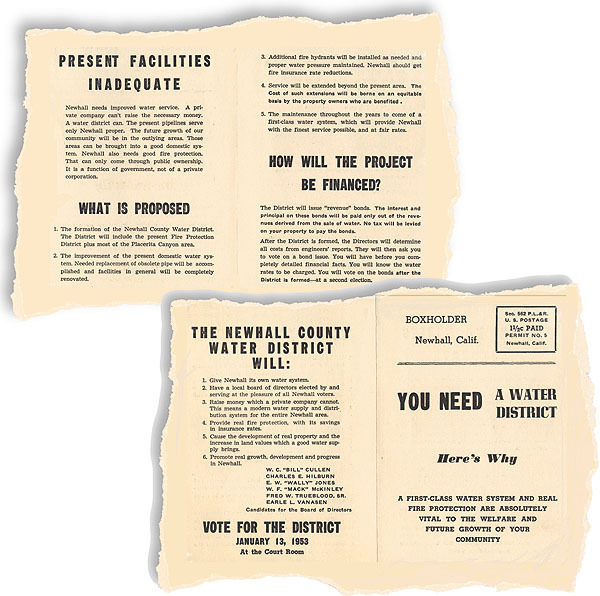 On January 13, 1953, an election was held to form the Newhall County Water District. Votes cast in favor of organizing the new district totaled 347; votes cast against amounted to 167. Voters also elected five governing board members: William C. Cullen, Charles Edward Hilburn, Earl W. Jones, William F. McKinley and Earle L. Vanasen. Mr. Vanasen was elected President at the first Board meeting held February 6, 1953 and remained in that position until he officially retired on April 14, 1959. Interestingly enough, it was a woman, Director Dorothy McNemar, who became his replacement. Later that year on August 4, the voters were asked to authorize the newly formed water district to issue revenue bonds in the amount of $425,000. Votes cast in favor totaled 465; naysayers amounted to a paltry 45. A. 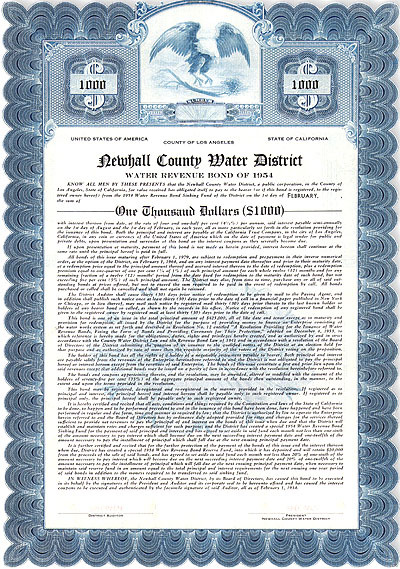 B. Perkins signed the documents in September 1953 finalizing the sale of the Newhall Water Company to Newhall County Water District for $130,000. The remaining bond money was used for rehabilitation and expansion of the newly purchased supply and delivery system with $20,000 set aside for reserves. Over the course of 46 years, Newhall County Water District has grown with the changing times of the valley. From the early years to the present day, the District has seen fit to adopt an aggressive building and maintenance program to continuously provide customers with high-quality water at a fair price. The original 6 wells that were purchased with the Newhall Water Company servicing 870 connections and capable of a combined production of 725 gallons per minute have all been abandoned. Sadly, the vintage aboveground redwood reservoir was dismantled in 1963. In 1966, water service areas in Castaic and Pinetree were incorporated into Newhall County Water District so that the agency presently serves three disparate communities in distinctively different geographical areas of the Santa Clarita Valley. In each water service area, groundwater is pumped from wells and supplemented by State Project water purchased from Castaic Lake Water Agency. Pending completion of new facilities, the District is supplied at this time by 12 wells with a combined production of 10,385 gallons per minute, 3 connections to State Project Water, 11 booster stations and 16 steel and concrete reservoirs with a total storage capacity of over 17 million gallons. On December 15, 1987, the citizens of Newhall, Saugus, Valencia, and part of Canyon Country joined forces to become the City of Santa Clarita, the largest incorporation in California's history. Today's population of the 11-year old city falls just below 150,000  a far cry from the 600 valley residents that welcomed A.B. Perkins in 1919. The community of Castaic encompasses an additional 15,000 and is on the verge of significant growth. Newhall County Water District is one of four retail water purveyors in the Santa Clarita Valley and currently supplies a population of approximately 22,000 with nearly 7,000 service connections. Originally published in NCWD's 1999 Annual Report.